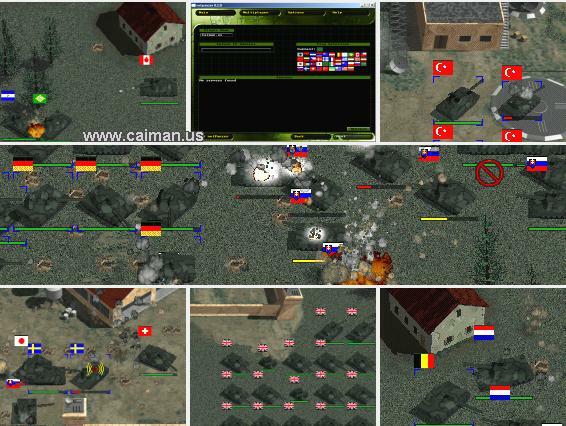 Caiman free games: NetPanzer by Pyrosoft Inc.
NetPanzer is an esxcellent online multiplayer warfare game with an option to play single player off line aganist 'bots.' I don't play online games much, so I went straight for this mode. This is a very good way to learn your way around the game because the game comes with a limited amount of help. You can also try out the various key combinations and not get beat to death or make a fool of yourself doing it. The special effects in this game are fantastic and the audio is superb and very realistic. The action is very fast paced. NetPanzer is supposed to be able to play mp3 files while you play the game, but I couldn't get it to work. With all the noise of tanks firing, shells exploding and people talking, I did not care about the lack of music at all! It works fine on an AMD K6-2 (380 Mhz) with Windows 98. 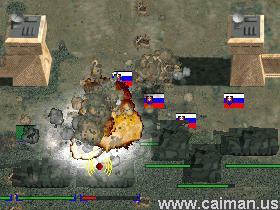 We at Caiman have also tested netPanzer on Windows2000/XP and have had no problems. Don't let the amount of key combinations intimidate you. NetPanzer is a fairly easy game to get the hang of. If you need a cheat sheet, just select/copy the key combinations which are below from your web browser, paste them into your text editor and then print them out. Underneath each tank is a green 'damage indicator.' This will change to yellow and then to red as your tank aquires more damage. We all know what the primary goal in a war is, but to acheive this goal, a fighting army must have a supply of weaponry. In this game it is tanks. One of the first objectives after starting this game might be to occupy a base so that you can manufacture new tanks. A base is considered to be occupied, when one of your (or opponent's) tanks reaches the heli-pad in the base. 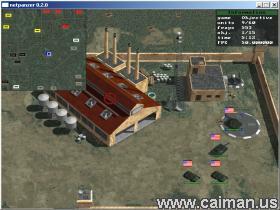 When your base is occupied, click on the large factory building and start manufactuing tanks! The menu which comes up allows you to build 1 of 10 different types of tanks, each with different chacteristics. This factory will start producing this model of tank until you change it or the base gets overrun. The following four commands are issued in a command window/DOS prompt. They are all issued in the SAME window. You will have to bring this command window to the front a total of 3 times. ... now press multiplayer and join to server address localhost"
Overall there are two things which make this freeware game different than a commercial game. The first is the price and the second is the lack of documentation.